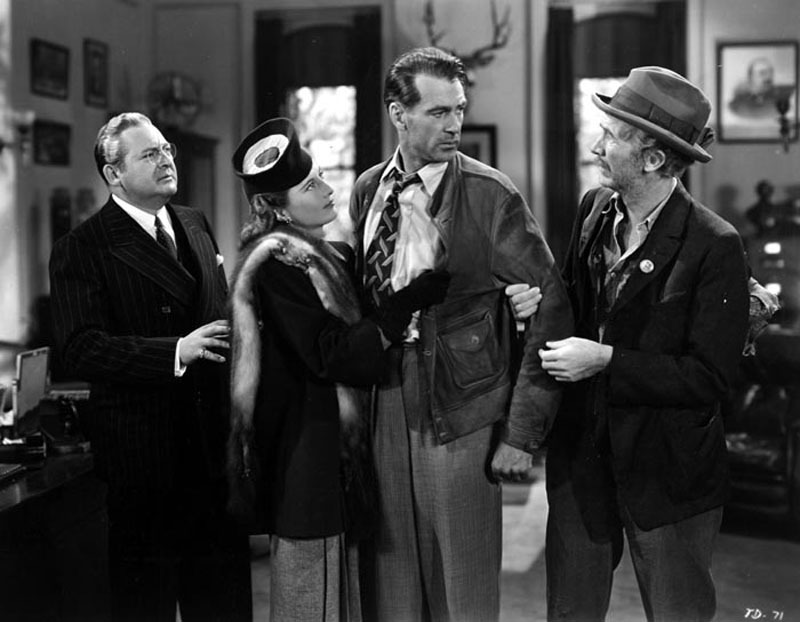 Meet John Doe is one of a groups of films that Frank Capra directed in the late 30s of the past century. The others are You Can’t Take It With You, Mr. Deeds Goes To Town, and Mr. Smith Goes To Washington. And a few years later Frank Capra also made that Christmas classic, It’s A Wonderful Life. All of them are classic examples of how movies can inspire at the same time as they entertain us. No one makes movies like that any more, and I recommend all four of these films especially to families with children. The messages and values are timeless. John Doe is a homeless hobo played by Gary Cooper. Barbara Stanwyck is a newspaperwoman who involves John Doe in pretending to commit suicide on Christmas night as an act of protest against unemployment and economic hardship. A national movement grows around the figure of John Doe, but behind the scenes D. B. Norton, memorably played by Edward Arnold, is using the movement for his own political purposes. When John Doe overhears Mr. Norton plotting with other big wigs how they will use the movement, John Doe decides to go through with the suicide after all. On Christmas night he goes to the top floor of an important building and prepares to jump off. The Barbara Stanwyck character has a gut feeling that he will do it and finds him just in time. Isn’t that beautiful? Have you ever thought of Jesus as a John Doe? But he was. He was not important in the eyes of the world. Even in the Gospels we read how many people considered him a fake. And there certainly have been many D. B. Nortons in the past 2,000 years who have misused and co-opted the name of Jesus Christ for their own egotistical purposes. The churches that carry his name have brought much shame to the purity of the gospel message. And yet, despite all this, 2,000 years later we still celebrate Christmas. Yes, Christmas has been commercialized and turned into something often unrecognizable. And yet, it’s still Christmas; it’s still the celebration of Christ’s birth. And the movement is still alive, still changing hearts and minds and souls; still bringing healing and forgiveness to the many John Does and D. B. Nortons and Ann Mitchells. I should also mention the other major character in the movie, another homeless hobo and friend of John Doe. He is known only as the Colonel. He is a cynic about human nature and he sees clearly long before John Doe what Norton and others are up to. There are cynics all around us, and there are plenty good reasons to be cynical. But cynics will never change any lives and they too need the healing that the Christ movement brings. Christianity is not an institution. It’s not a religion. It’s not a philosophy or a self-help course. It does not promote a feel-good narcissism. Christianity is a movement – an exciting, world-transforming movement. More than ever, today we need to recover the original vision of Christmas, the message of the original John Doe. Today the church needs to get off its comfortable place among the D. B. Nortons of the world and join the John Does who still have the naivety to believe that the world can be a better place, a holier place! I want to be a John Doe. Do you? Let’s join the movement; it’s all around us; it’s in our hearts. Categories: Uncategorized | Tags: Christianity as a movement, films with message, Frank Capra | Permalink.